This past Saturday, I spent almost 10 hours outside on the capitol grounds in Jackson, Mississippi. Under normal circumstance, you might have to be crazy to do that in August, but this was no ordinary Saturday. It was the 3rd annual Mississippi Book Festival, and I was there in my third role. The first year of the festival, I came down as a volunteer, and spent my morning in the Information tent, telling people where to go and how to get there: questions I quickly learned how to answer, even though I hadn’t been there myself. Fortunately, by afternoon, I was relieved from my post and went inside. I even managed to get into a few of the panels (attendance was high that first year, and you had to get in line early — attendance is still high, but there are more sessions in bigger rooms, which helps). My second year, I was on the poetry panel, so I spent much of my time indoors waiting for my panel, reading, and listening to other panels. I did go outside to sign books and then to browse the bookstores and exhibitor booths. This year, I opted to be an exhibitor myself, getting a booth for our low-residency MFA program. 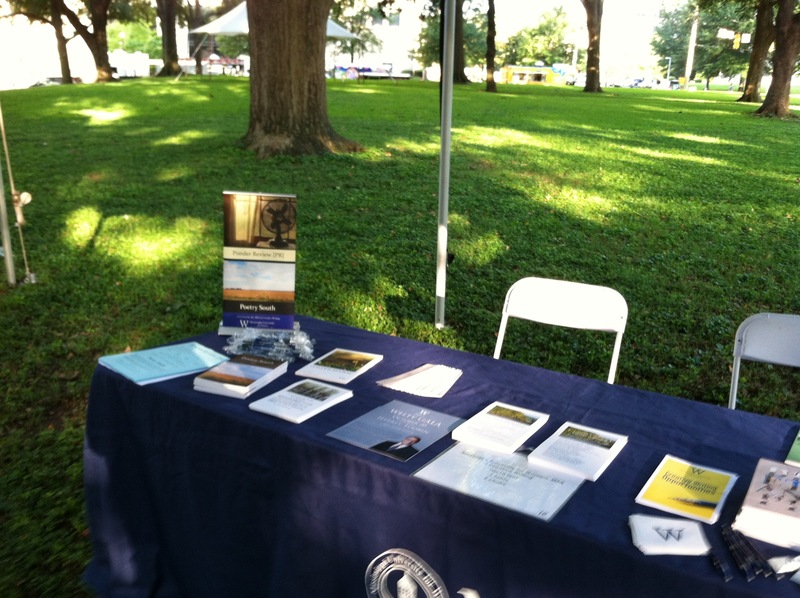 I also brought along brochures for our undergraduate concentration, the Eudora Welty Writers’ Symposium, the Ephemera Prize for High School Writers, Poetry South, and Ponder Review. I even brought my books and a brochure for A Writer’s Craft. One thing I learned was that if you arrive at 7am and stay outdoors all day, it doesn’t seem as hot as it does when you come back from a midday break indoors and experience the heat full strength. The shade helped enormously, of course, as did the occasional downdraft of cooler air from one of the pop-up thunderstorms that went over, but didn’t drop much rain (thank goodness, though I had a tarp, just in case). And naturally, it’s good to bring plenty of water and dress appropriately for the weather. I kept my water bottle filled, and I wore a new quick dry, W Owls polo. It was also fun to meet the other exhibitors, and to talk to all the attendees who stopped by. It was great to meet prospective students, writers, high school students who were excited about the Ephemera prize, and W alumni who wanted to reminisce about the good old days. Thanks to Carol Ruth Silver and Michael Farris Smith for stopping by, as well as to current MFA students Sally Lyon and Katrina Byrd. It was also great to see all the young kids who were enjoying the book festival: one barely old enough to read, but very excited to be there. 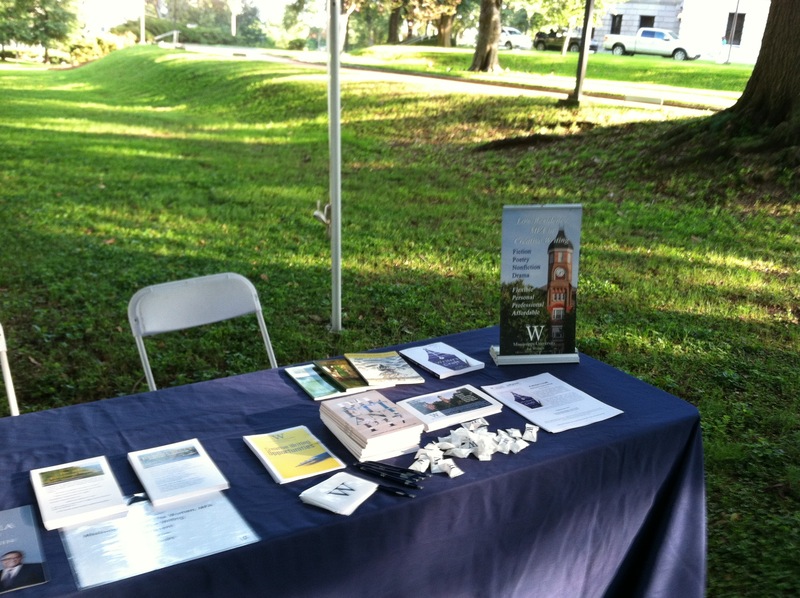 I gave away nearly all my brochures, and even ran out the one for the Eudora Welty Writers’ Symposium. I passed out copies of Poetry South, along with bookmarks, calls for submissions, pens, stickers, and the ever popular W mints. Though I didn’t get to go inside to catch any readings (next year, I need some helpers), when I did go in for my break, I could tell the crowd seemed every bit as big as in years past, and every bit as satisfied with the event. And when I was outside at the table, I was entertained by live music, people watching, butterflies, and a gorgeous day. If you haven’t been to the Mississippi Book Festival, you owe it to yourself to go next year. If you’re a writer, you might get on a panel (or set up your own booth for self-published and small press authors). If you are with a literary or arts organization, then you might want to have your own exhibitor’s table. And if you’re in the general public, then you can just go and enjoy all the free readings and entertainment, and maybe even buy a book or two. There are also plenty of food trucks with po’boys, catfish, popsicles, and other summer delicacies. It is billed as the “hottest book festival in the country,” but don’t let the fact that it’s in August hold you back — if my fellow exhibitors and I can handle staying outside all day in 90+ degrees with a heat index over 100, then you can handle trips to the outdoor tents sandwiched in between readings in the Capitol and neighboring venues.